I like the ‘farmer’ version best, since the constraint is most plausible. To improve the ‘pool’ version, you should say that the expensive resource is the tiles used for the border. Both are slightly BS, because rectangles are better for other reasons: primarily that perimeters aren’t that costly, and rectangles pack more easily, wasting less area. Farmers’ plots of land pack together better if rectangular, and swimming pools can pack more lanes if rectangular. You can also talk about drops of water trying to minimize surface tension. Or a group of campers trying to ring the perimeter of their campsite with (the minimum number of) campfires to keep out a herd of hungry wolves. I wonder if the “geometry” formulation was rated more interesting because of the slick-looking graphic and the possibility that there is an optical illusion going on. I think the graphic is really pretty unclear. It’s not at all obvious that the perimeter of each object corresponds to the length of the straight line matching it. I am straying a bit from your post, but you got me to thinking…. Perhaps we should begin to use “Real-Life” rather than “Real World”–while describing challenges as real-life problems also has the potential to be just a nebulous as real world different terminology might help us make the point to students that the mathematics they are learning has real life application. Shouldn’t that be our goal? By that I mean our ultimate goal should be to challenge students with interesting, engaging problems that develop their understanding of mathematical concepts they will encounter in their life outside of the school environment. With regard to what increases student interest – I have a different take on that, at least from my personal experience. When my students have been asked why they think I am a good teacher (compared to others they have had), they mostly say it is because I make math more “fun”, but not because of the types of problems I choose or because I make them more accessible. They say it is because they can see how much I love math and how excited I am personally about the subject and that that enthusiasm is catching. So maybe it is not always about having the students be interested in the problem, but sometimes it is more important for the teacher to be interested in the problem. I know this is likely a heretical thought. But I can give a good analogy. There are many hobbies in life I have no interest in whatsoever. Stamp collecting, for example. I think stamp collecting sounds horribly boring. However, when I have met a person who is passionate about collecting stamps, it is fun to take to him or her about it. I learn to see it in a whole new way. I will still never collect stamps myself, and I still think the topic is boring, however during those moments it was interesting to talk about and think about, and that gave me a new overall appreciation for the topic. This was entirely due to the passion and interest of the person I was talking to. I am not saying that making the material directly interesting to students is not important, but I think it is a mistake to underestimate the effect of teacher interest as well. I’d like to agree with David here, and on his comment to the original question. Engaging kids has little to do with how real world a task is. I do think that relating some math concepts to things kids know about and relate to in their real world can help understanding (Example: the activity where the kids take a too long text message and shorten it by doing things like substituting IDK for I don’t know connecting to powers of 10 and scientific notation. We did this just yesterday and it was very successful. So now we call that “math texting”). We all teach the same content–what’s different is how we organize our classrooms for instruction, the collaboration we allow (or don’t allow), the activities we choose and how we introduce and facilitate them, the work (including homework) we assign…I’m sure there are more but I think these have more to do with engaging kids then how real world a problem is. And teacher enthusiasm is also important, as David said. I know a guy who collects and repairs old fountain pens, and he makes that seem really fascinating. Do you mean that it’s important to know their world as in their experiences, or do you mean that it’s important to know their world as in “the world of the mind”? Or maybe both? With the caveat that a teacher has an important role in expanding said world. If we only meet students where they are, then they’ll stay right there. That said, when I was a middle school teacher, I was often surprised and impressed by what students were interested in, and the seriousness with which they approached [what we might otherwise assume to be] adult-level questions when given the opportunity. If this diagnosis is correct, then the cure is to design lessons where connection-making is a big part of what we do, and where the process of abstracting is done *gently,* not abruptly. Dan has lots of great ideas on this last point that I have tried to implement in my practice. 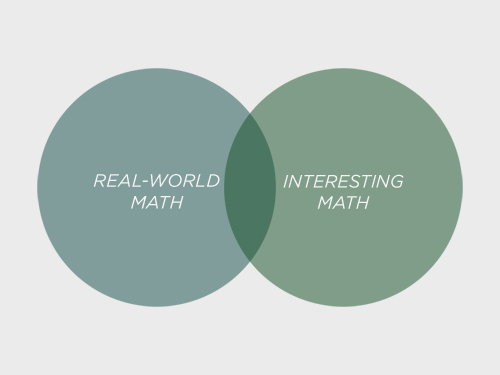 What does it mean for math to be “real?” I’ll say that learning becomes real to students when it is comprehensible, accessible, connectable to prior knowledge. Did you ask any students which problem they found more interesting? Or see which problem they persisted with the longest? “And for the sake of interesting your students in mathematics, it’s more important to know their world.” In my experience this is just absolutely THE thing. I think your “high abstraction” version illustrates well what can go wrong with that kind of thing. However, I think the formatting is making it worse. I believe I read something from you years ago on this site about what a benefit whitespace is for students processing a task. I’ve always found that to be true myself. Consider this treatment http://i.imgur.com/DQoUZvI.png taht I just put together. It is similarly high-abstraction, but it still uses some style elements to make it easier for the reader to engage. I also purposely asked a question, which I feel the high abstraction type tasks usually do, but I didn’t try to ask *all* the questions. “Real-world” is less important than “interesting”…I got it. But I think too many comments here suggest that there are no universal principles underlying what people find intriguing or puzzling; that it’s all relative; that it’s all about whether the activity is connected to their world. My guess is that there are some universals. For example, this new book by a cognitive scientist examines the universals of humor–what goes on in the brain when people find something funny. It can’t be understood in a completely reductionist perspective, but there are universals. I think a similar analysis could be performed for puzzlement. Thank you for writing such a wonderful thought-provoking post. I am so pleased to have found your blog. As a elementary school teacher of 10 years, currently working at LAUSD, the pressure that is placed on teachers to create lesson plans that students find to be uninteresting for the sake of preparing for standardized tests, is ultimately harmful to the student. I love the idea of creating “life” questions instead of “math” questions, and having math problems that relate to the student’s world instead of the “real” world. My students often sarcastically ask me how math problems can be applied to the real world, and I have always thought of coming up with real world math examples to be the greatest tool for engaging students in learning math. This post has challenged me to go beyond the idea of the real world problem, and take the “their” world problem into the classroom. *As a daily part of a diet low in saturated fat and cholesterol, 3g of soluble fiber from oats as in Quaker Whole Hearts can help lower cholesterol, which may reduce the risk of heart disease. This product provides .75g per serving. I’m not a Maths Teacher, have been given a year 8 class to teach percentages to and surprisingly they seem to have understood and loved the work. “This is the best Maths ever, you can see how it works”, was one comment.Each student created a virtual shop with internet images and selected images of ten products. The choice, fashion, sport or home wares. Each product was given a wholesale price by the students and then had to be marked up by % to give a sale price. A few test goes of adding percentages because of new season stock or a franchise decision and they had the idea. Then the “test” it was SALE time. I put together a number of photos from the local shopping centre of store windows with signs of % off. We worked through images of 8 stores taking % of a selected item at each new image. YES everyone got it right. Now we have moved on to using a credit card for the purchases and looking at the percentage interest. The result, engagement, enthusiasm, understanding of the concepts. Their comments, it didn’t even seem like we had to do maths. As a non Maths Teacher we covered a lot of ground in many areas in just a few lessons. Real World Maths? 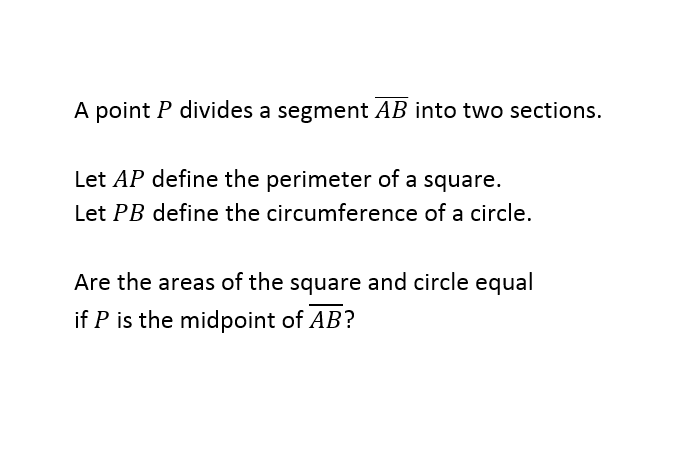 The SRI Report On Khan Academy: Helpful, Not Transformational	Dear Mathalicious: Which Of These Questions Is “Real World”?